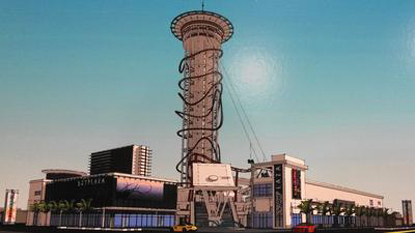 Although many people lobbied against it, this past Tuesday, Orange County commissioners unanimously approved a 501-foot roller coaster, which will be called the Skyplex Orlando and will be located on International Drive. The $500 million project, which is planned to be built at the intersection of International Drive and Sand Lake Road, needed final county approval before moving forward in planning and construction. It was ruled in July that the 501-foot roller coaster, which would be the tallest in the world, did not pose a threat to aviation traffic. The FAA approved the tower’s height up to 700 feet. Plans for that tower include a thrill-drop ride built inside the framework of the roller coaster, an observation deck and a rotating restaurant, said Wallack. Kantor (Skyplex attorney) said the tower would not be taller than 600 feet. Those in favor of the project, including Orlando attorney and real-estate agent Mark NeJame, said the development was necessary for the continued growth of North I-Drive. “And I think the thing that’s important to remember is this wouldn’t fit most places, but I-Drive is the place for projects like this, and that came across loud and clear,” Jacobs said. It is hoping to be open in 2018.